Hello friends and welcome. Another week has passed, how time flies. So it's Friday and like usual I am sharing a few more journal pages, so here goes. I used the same techniques I usually use for this journal, Gesso over Dyan Reaveley's original artwork, then some acrylic paints and finally background stamping, stamped ephemera and washi tapes. Here's a close up of my right side page. I though I would also share one more page from my daily junk journal. For this page I decided to leave lots of blank space for journaling and writing practice. Well, that's it for this week, I will be back next Friday with a project for A Vintage Journey, see you then and have a great week! THanks you for another feast of inspiration Astrid, I always appreciate taking in what you have to offer. WOW Astrid, this is beautiful. So creative with the tiny person and background. Your pages are always so beautiful, what a wonderful place to journal or contemplate! Thanks for the pocket tutorial, it works wonderfully! Fabulous journal pages. I love how you are altering the planner to suit your own special style of crafting.Your writing looks awesome as well. Another load of beautiful journalwork here Astrid. Amazing pages with beautiful work in it. I love your lettering and how you´re building things up on each page. It just looks amazing every time, and I wish I was as clever as you. More beautiful pages for us to delight in, I really do enjoy exploring every detail and I know that as good as photography is there will be much much more to discover within those layers. Corner pockets are just the ticket for creating that extra space we need. The Boy certainly does look like he is waiting to get a move on, I can almost hear the drumming of his fingers hee hee!! Wishing you all the best this weekend with much creativity. I love the journalling pocket, and the spareness of the stamping on the opposite page - ready to inspire you when you're ready to write. Lots more inspiring ideas for would be journal makers. I admire the way you keep going when you start something. I always want to make a journal and do manage a few pages but then it stays there waiting for more. What a fantastic journal and this page so wonderful. Again I want to feel it in the real!!! 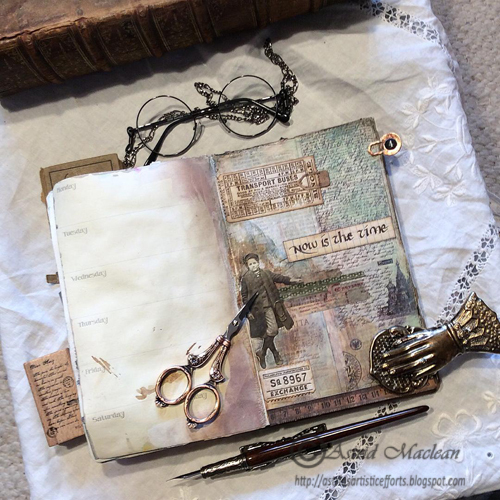 I love your art journal pages - they are absolutely stunning Astrid! Gorgeous! Astrid, I do love your pages! Do you have these planned out? or do they just happen as you create?They always come together so beautifully. Such beautiful vintage vibes-your journal could be sold in an antiquities shop!